But now – by torpedoing Theresa May’s “Thank U Next” approach to voting on her deal – he just placed himself firmly at the centre of the drama. So what’s his role? And why is he such a big fan of order? Firstly – what just happened again? The prime minister was hoping for another chance to put her Brexit deal to a vote – it would’ve been the third time. But Speaker Bercow decided that can’t happen unless the deal has changed or a new session of Parliament begins. John Bercow might as well have followed it up by donning pair of sunglasses and playing a blast of Meek Mill’s I’m A Boss over the Commons PA system. So that’s why he steps in when things get too rowdy with his trademark cry. Contrary to popular belief, he’s not simply a fan of hors d’oeuvres. For the record, John Bercow was originally a Conservative MP but he’s been the Speaker for nine years now. Read interviews with John Bercow and it’s clear how he sees his role today – making sure no political party disrespects Parliament by bending or breaking the rules. And he says that’s especially important now because no party has a majority in the House of Commons. Some Brexiteers just see him as a frustrated Remainer trying to prevent the UK leaving or at least push us towards a “soft” Brexit where we keep close ties to the EU. He’s become popular across the rest of Europe as well, with German newspaper Die Welt claiming last weekend that he’s better known there than any of our party leaders. The Sunday Times described him as “Europe’s surprising new pin-up”. 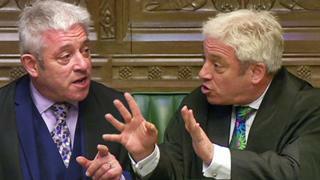 That’s how Mr Bercow described his role as Speaker when he was interviewed by the US broadcaster CNN. So as Brexit rumbles on expect to hear “Odd-DEURRR” this afternoon and every weekday for quite some time to come. Probably.